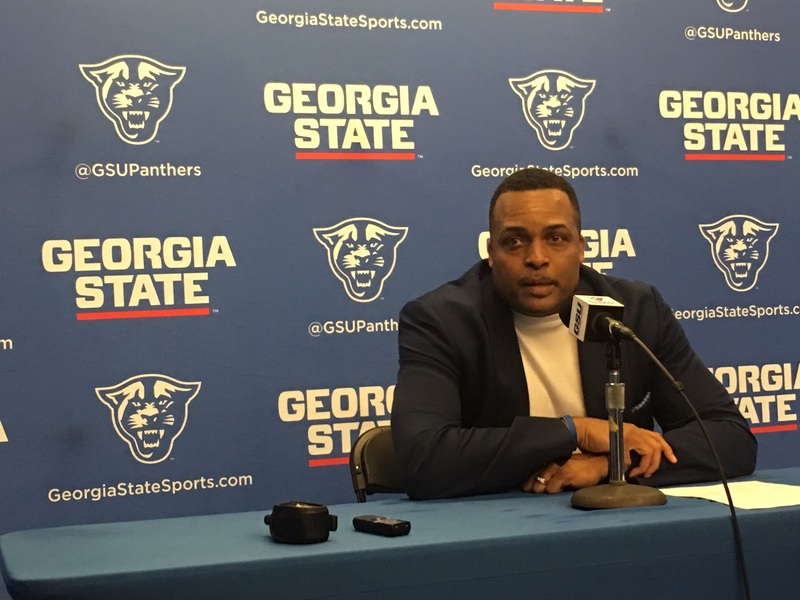 Coach Hunter speaks to the media after a loss to UMass. Hunter and four players had the flu during the Dec. 28 match up. Georgia State returned home Wednesday to face UMass after an impressive win against a dominant Middle Tennessee team. Unfortunately, several Panthers’ players, including head coach Ron Hunter, were battling flu-like symptoms and were unable to continue their win streak, as they fell short against the Minutemen 74-65. This loss is number five for Georgia State at home since the beginning of the 2013-14 season. “We had a few guys who we probably should not have played today because they were battling the flu, but they fought and gave us everything they had. With that said, UMass played well, and they deserved the win. Umass was lead by DeJon Jarreau who had 13 points, seven rebounds, and five assists. Rashaan Holloway (12), Donte Clark (12), Luwane Pipkins (12) and C.J. Anderson (10) also found themselves scoring in double-digits for the Minutemen. UMass (10-3) is currently on a four-game winning streak. For the Panthers, Jeremy Hollowell had a game-high 16 points and managed to grab four rebounds. Sophomore guard Malik Benlevi continued his high-level of play adding 13 points and three blocks. Willie Clayton came off the bench for the first time this year for the Panthers and almost tallied his third double-double with eight points and 12 rebounds. Clayton still managed to play 25 minutes for the Panthers. The Panthers certainly had an off-night as they shot a paltry 38.7 percent from the floor and just 27.3 percent from three-point range.Not to mention, they also shot just 52.4 percent from the free-throw line. They never got into a rhythm offensively and failed to exert enough energy defensively to put a halt to the many runs put together by the Minutemen. The Panthers felt the effects of not having a key contributor in D’Marcus Simonds (9.2 ppg), who appears to be suffering from a bone bruise injury, according to coach Hunter, against the Minutemen. 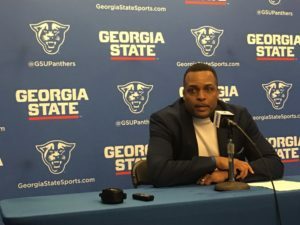 Coach Hunter anticipates Simonds’ return to the team as he prepares his Panthers to face Georgia Southern in Statesboro on Saturday at 12:30 p.m. This marks the first conference game of the season for Georgia State.